Hanoi (VNA) – Vice President Dang Thi Ngoc Thinh on August 25 presented the Friendship Order to History Professor Odon Vallet from the world-renowned Sorbonne University in France. 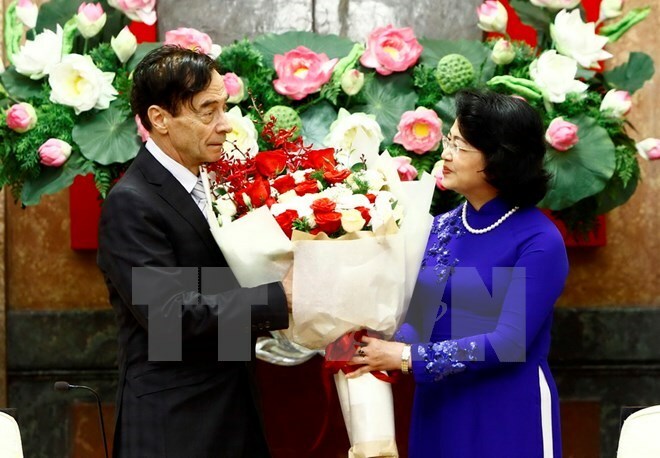 The French-born Vallet was honoured in recognition of his contributions to bringing study opportunities to Vietnamese pupils and students through the Vallet Scholarship Programme as well as promoting Vietnam-France relations. She said Vallet scholarships have become a source of encouragement to Vietnamese students in the past years and expected the French professor to further his support for Vietnam in education development and children healthcare and protection. Expressing his honour to receive Vietnam’s noblest order for foreigners, Odon Vallet underlined that he will continue to present scholarships in fields of science-technology, mathematics, chemistry and biology to Vietnamese disadvantaged pupils and students in mountainous, remote, border and island areas. Many of the Vallet scholarship recipients have received the world’s scientific awards, he added. From 1990, through the Aid to the Children of Vietnam (AEVN) in France, Odon Vallet made financial contributions to repairing and upgrading SOS Children’s Village in Lam Dong, Thua Thien-Hue, Quang Binh and Nghe An.